HARRISBURG — Since cruising to victory two months ago to win another four-year term, Democratic Gov. Tom Wolf has signed executive orders to push redistricting reform and reduce carbon emissions, and declared that the state needs to take a serious look at legalizing recreational marijuana. Nearly every time, leaders in the Republican-controlled legislature, with whom Wolf has been at a detente since his first, tumultuous year in office, complained that the governor was doing an end-run around them to advance his liberal views. So when Wolf, 70, takes the oath of office at his second inauguration Tuesday, the question many will be asking is: Who will show up? The politician who launched his first term as an unapologetic progressive or the more pragmatic statesman he became? Sitting in his office last week, Wolf appeared almost amused at the question. “I’m pretty much the same person I was when I got here four years ago,” he said. And though he won decisively in November — capturing nearly 58 percent of the vote and even winning some counties that had trended Republican in past gubernatorial elections — the political climate for pushing through his agenda is not particularly favorable. Republicans lost seats in both legislative chambers, but they still hold commanding majorities in the Senate and House of Representatives. And the GOP lawmakers who remain are more conservative because some of their more moderate colleagues, many from the Philadelphia suburbs, were defeated by a “blue wave” of voters this past November. Wolf talks openly about his goals: providing adequate funding for public education, tackling the opioid epidemic, and strengthening government ethics, among other initiatives. But lurking in the background once again are financial strains, not unlike the ones the governor faced throughout his last term. The state is projected to have a $1.7 billion shortfall in the fiscal year that begins July 1, according to an analysis late last year by the state’s Independent Fiscal Office. Few expect a repeat of his first year in office, which was marked by a bruising, nine-month showdown with the legislature over the state budget. At the time, Wolf had proposed a bold but controversial plan that would have overhauled how Pennsylvania taxes its residents. Legislative Republicans hated it. Wolf stuck to his guns for months, until it became clear that, politically, he wasn’t going to win the battle. After that, Wolf took a less combative tack in his dealings with the legislature, which allowed him to strike deals on such big-ticket policy items as pension reform, liquor privatization, and medical marijuana legalization. “I think when he came into office, there was a bit of over-optimism on his part,” said Chris Borick, director of the Muhlenberg College Institute of Public Opinion. "You have to have enormous amount of trust across both sides of the aisle to get gigantic reforms done, and I think he underestimated how hard that would be." Still, since the election, Republicans have been closely watching Wolf, who will be joined by a new understudy: Lt. Gov.-elect John Fetterman, who is among the most outspoken liberal elected officials in the state. Wolf’s creation, through executive order, of a reform commission to study ways to limit partisanship in redistricting elicited howls of complaint from Republican legislative leaders. Their problem, they said, is that Wolf is stepping into territory the constitution gives squarely to the legislature, which has the power to draw congressional and legislative district lines. Then, late last month, Wolf said he believed it was “time for Pennsylvania to take a serious and honest look at recreational marijuana.” Before that, Wolf said he did not believe the state was ready for that step, which would require the legislature’s sign-off. Senate Majority Leader Jake Corman (R., Centre). Corman is among those who will be listening intently to see whether the governor, in his inaugural speech, drops any clues that signal a change in the way he will approach governing. Governing by executive order, Corman noted, will not win him allies. Senate Minority Leader Jay Costa (D., Allegheny) said he believes that Wolf can advance a more progressive agenda, but that the issues he cares about also resonate with many Republicans, including criminal justice reform and environmental protection. “Those are deemed to be `progressive' issues, but there is bipartisan support for them,” Costa said. 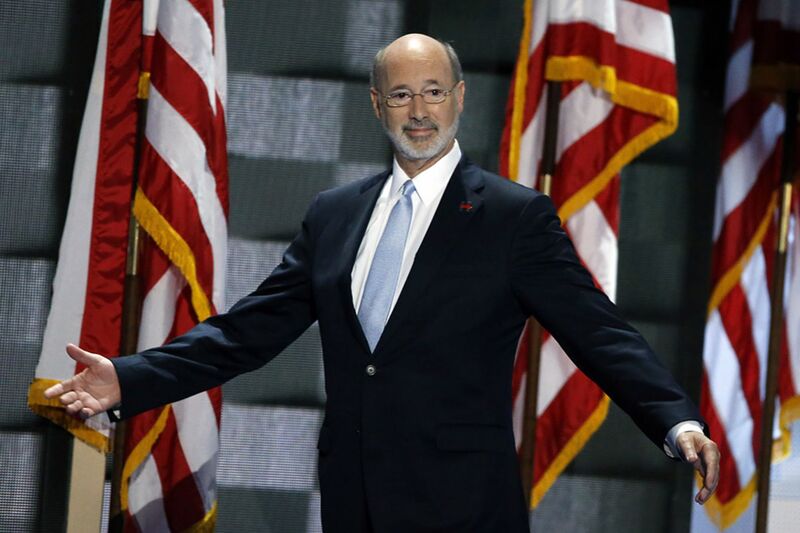 When he steps onto the stage Tuesday to deliver his inaugural address, Wolf is widely expected to showcase what he and the legislature have accomplished, despite deep ideological differences. He is also expected to do some political chest thumping of his own, discussing progress his administration has made in attacking the opioid epidemic, expanding Medicaid, and helping seniors live at home as they age. But he said he also wants to talk about democracy.